Our neighbors in South Carolina recently asked for and received special permission from the federal government to allow child welfare agencies a license to discriminate. This is a back door toward a broader movement to discriminate against LGBT people, OK’d by the head of the U.S. Department of Health and Human Services. Does this sound right to you? In Georgia, we know the harms of a license to discriminate in adoption. We’ve fought legislation like this for two years. Of course it’s not right. Diversity of all kinds brings richness to our lives. Preventing loving people from fostering or adopting, or a child or a youth who identifies as LGBT from being fostered or adopted, is not only immoral but harmful. That’s because according to the HHS, 1 in 5 youth in foster care identify as LGBT. That’s thousands of children who potentially won’t find loving homes because lawmakers are determined to enact a nationwide license to discriminate. Congress can fix this situation. They can hold oversight hearings and move to pass the Do No Harm Act to ensure that religious exemptions cannot be used in any state to harm vulnerable children in the child welfare system. They can also discourage other states from seeking similar waivers. Please, do not wait for Georgia to make a similar request. 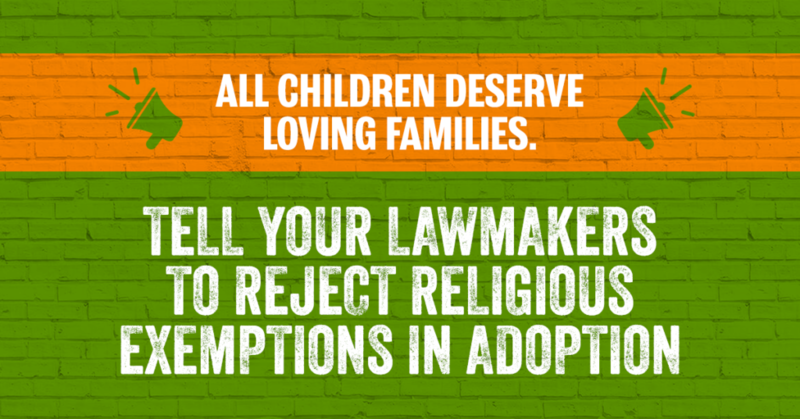 Call and email your members of Congress now and urge them to support the Do No Harm Act to guard against a federal license to discriminate in adoption.